Originally produced by CP & Publishing, Jennifer Smith & "Life's Toughest Moments: A Parent's Guide When Facing End Of Life Decisions With Their Child" is a a book written by Jennifer Smith, RN and Bradie Kvinsland, CCLS to help families advocate for their child during the end-of-life stage, create meaningful memories, and take steps in the first few days after the child has died. Aubrey Zimney, mother of Anna, and co-founder of A Common Bond (www.acommonbond.org), a non-profit foundation established by former ICU parents, which assembles comforting care packages for parents of hospitalized terminally ill infants. She writes, "When our daughter Anna was dying, I often tuned out whenever her caregivers began discussing end of life decisions. It was too painful to hear out loud, and it seemed like asking questions was admitting that her illness had already defeated her. This book allows a parent to explore the possible scenarios of the coming events in privacy, with an option to close the book whenever it gets to be too much. Even more importantly, it provides ideas for meaningful legacy building and special moments to share, in a time when the parent's mind may be too exhausted or cloudy to come up with them on their own. For us, having small things to share and look forward to with Anna during that time gave us reason to hope. The spark of hope that keeps a parent going through a child's illness does not have to die when a child is dying. Having hope for a visit to be enjoyable, hope for a pain-free night, or even hope for a peaceful passing is essential in order to maintain some sanity for the sake of your child. 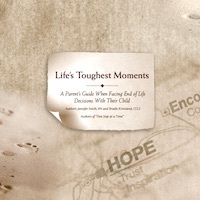 "Life's Toughest Moments" is a priceless companion to anyone confronted with the difficult choices no parent should ever have to make." For more information and to order printed copies, please visit the official publisher's web-site at www.journeytowardhealing.com.